"............they’ve lived with man, as is very, very evident”. “I’m really not prepared to say that dinosaurs actually are extinct. As I said, I’ll go so far as to say I think they probably are, ‘cause I haven’t seen any, but if they have gone extinct, it’s only fairly recently. You know, you can certainly find historic accounts of people having seen what they might refer to as dragons. Even as recently as two hundred years ago, there’s an account of a civil war battle, sorry I should make clear, English Civil War, not the American Civil War, the English Civil War battle, the battle of St Fagans, which although is in the English Civil war actually took place in Wales. And after the battle in which there were a lot of people dead on the battlefield, there are some eyewitnesses who wrote about it at the time, who reckon that this large huge bird without feathers, this dragon type thing, swooped over the battlefield and was sort of, it was obviously a carrion eating thing, it was having it’s fill of dead bodies, a rather gruesome story but the description sounds very like a pterodactyl type”. Further examples of the of the 'pterodactyl only became extinct recently if at all' claim are provided by books and websites authored by Jonathon Whitcomb, Norman Huntington and Nathaniel Coleman. On the face of it, then, it appears that Hovind and Taylor are far from the only people making the claim. A little internet sleuthing, however, reveals that these three gentleman are, in fact, the very same person; American fundamentalist Christian and videographer Jonathon Whitcomb. Any reasonable person would come to the conclusion that making an identical claim under three separate names is no more than a dishonest attempt to make the claim appear to be more credible than it actually is. Indeed, Whitcomb has admitted that his evidence relies solely on uncorroborated 'eye-witness' accounts and, after examining over 14,000 photographs of alleged pterodactyls, he has yet to identify a single specimen. Now, apart from my being utterly incredulous, Hovind, Taylor and the Huntington/Whitcomb/Coleman's pterodactyl claim is of interest to me for three reasons; first, Wales is my adopted country and I have lived here for over 25 years; second, I have visited the village of St Fagans several times and third, I have an avid interest in Welsh history. To give you some background to the alleged event: St Fagans is a small village on the western outskirts of Cardiff, which is the capital city of Wales. The battle of St Fagans occurred near the end of the English Civil War in 1648. It is estimated that 3,000 well trained and equipped Roundhead soldiers supporting Parliament confronted 8,000 Royalist soldiers supporting King Charles. The Royalist army were referred to as ‘Clubmen’, being largely made up of untrained soldiers armed with only clubs and billhooks. It was the largest battle ever to take place on Welsh soil, and quite possibly the shortest. Beginning at 7.00 am, it was all over by 9.00 am with many hundreds of Royalists killed or taken prisoner. The National Museum of Wales has a very large open-air facility at St. Fagans, including a completely rebuilt traditional Welsh village with exhibits pertaining to Welsh life over the centuries. You would expect, therefore, that the largest battle to take place in Wales would feature prominently in the exhibits, and of course it does. Indeed, in the intervening years, a number of skeletons, cannon balls, musket balls, pykes and buttons have been found on the battle site, many of which are on display at the National Museum. And you would equally expect that such a significant event as written eyewitness reports of a pterodactyl-like bird swooping down and having it’s fill of dead bodies would also warrant mention. Except that the event is conspicuous by it’s absence. There is simply no mention of pterodactyls at St. Fagans. Indeed there is no mention of pterodactyls at St. Fagans at all, anywhere in the legitimate historical literature or even on the internet, apart from Paul Taylor’s claim, broadcast on the Creation Today Show of October 14th 2011. This is especially surprising as, in common with the other Celtic nations, Wales has a long history of imaginative storytelling. Walk around anywhere in the Welsh landscape and choose any landmark and there will probably be a tall story attached to it. The large collection of ancient stories known as the Mabinogi, for example, detail the mythical origins of many Welsh landmarks and the dragons, giants and wizards who dwelt among them. Pterodactyls would certainly not be out of place in Welsh folklore. "What harm would it do, if a man told a good strong lie for the sake of the good and for the Christian church … a lie out of necessity, a useful lie, a helpful lie, such lies would not be against God, he would accept them." "Some scientists speculate that Noah took small or baby dinosaurs on the Ark … are dinosaurs still alive today? With some recent photographs and testimonies of those who claimed to have seen one, scientists are becoming more convinced of their existence ….....Have you heard of the ‘Loch Ness Monster’ in Scotland? ‘Nessie,’ for short, has been recorded on sonar from a small submarine, described by eyewitnesses, and photographed by others. Nessie appears to be a plesiosaur". 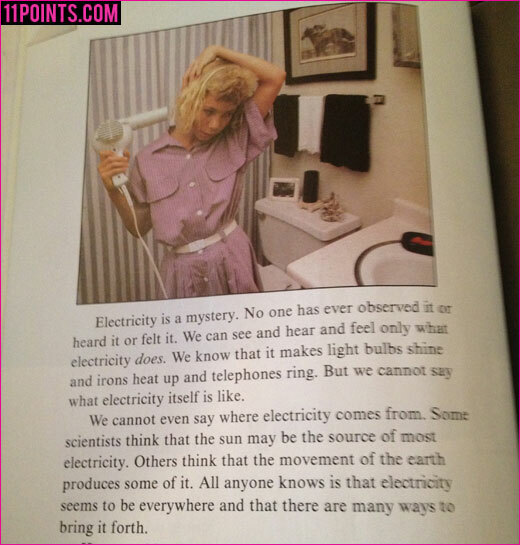 Unbelievably, parents actually pay for their children to be taught this stuff. I'd love to see their evidence that extinct species of dinosaur lived with people and of the four possible answers to Question 16 none are scientifically valid. Note the exclusive use of multiple choice, 'fill in the blank' and one or two word answers. This is a hallmark of fundamentalist Christian education. Students are actively discouraged from developing comprehensive arguments using empirical evidence and critical thinking and analysis in favour of regurgitating simplistic 'off-the shelf'' answers and explanations of complex issues. After all, what's the point of teaching the physics behind the CERN Large Hadron Collider when we already have "The History Book of the Universe"? 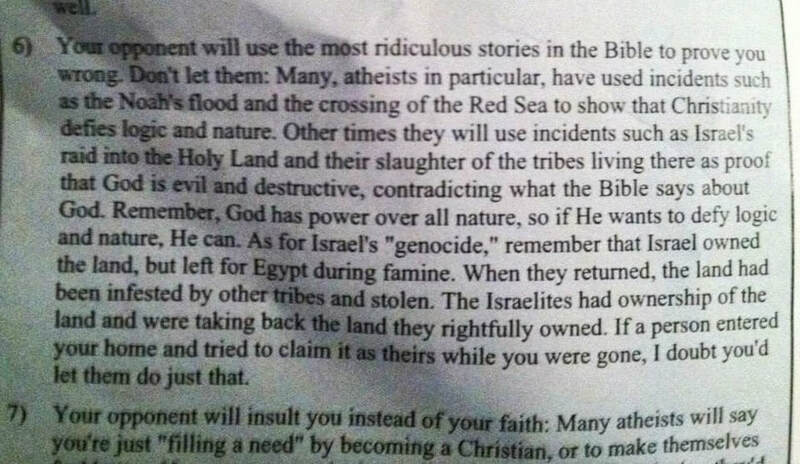 Below is a page from a biology test given to high school students in the UK in those schools employing the 'Accelerated Christian Education' teaching system. 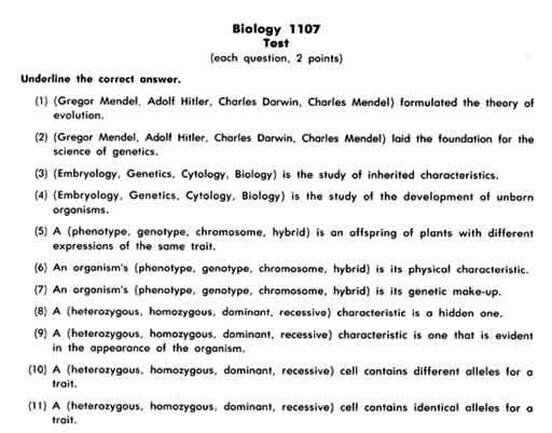 Note the less than subtle linking of Adolf Hitler with evolution and genetics in the first two questions. I examine in detail this fatuous myth, made almost exclusively by Christian fundamentalists, in my essay The Myth that Darwin Influenced Hitler. ​Accelerated Christian Education includes no secular books at all in the curriculum. Unbelievably, English literature classes contain no works of fiction. Instead, students study biographies of missionaries alongside anti-evolution books such as 'When Science Fails' and 'After the Flood: The Early Post-Flood History of Europe Traced Back to Noah' (the latter considered, of course, to be non-fiction). Modern history is taught exclusively in dichotomous terms as a battle for supremacy between absolute good and absolute evil, Biblical vs. non-Biblical values and conservative vs. liberal values but never are these "thought terminating clichés.......brief, highly reductive, definitive-sounding phrases" (as American psychiatrist Robert Lifton aptly terms them) explicitly defined and openly discussed. For example, one Accelerated Christian Education high school textbook teaching politics, goes by the title, 'Wisdom Pack: Sinners Need Big Government'. It is in the form of a comic book, and so quite comically groups together "pornographers, drug pushers and other humanists." ​A number of things should ring alarm bell here. First, the ludicrous analogy between a tribal group who had occupied apparently empty land for 400 years with someone entering your home and claiming it as their own (as well as the oh-so-sweet irony that, by their own criterion, the Americas were "infested" by foreign peoples; using their own logic don't Native Americans have every right to take back the land they "rightfully own"?). I doubt very much whether any debate regarding that issue is encouraged in class. Second, note the overt racism and dehumanising in describing the land as having been "infested by other tribes". This sort of attitude should come as no surprise. Bob Jones University, one of the largest publishers of Christian home-schooling textbooks in the world, allowed no black people among its 5000 students until 1971 and only then because it risked losing access to federal government funds. It was their advertised policy not to accept black students on purely Biblical grounds. Even when it eventually did so the university saw fit to ban interracial relationships between students, on threat of expulsion, for another 28 years. Third, what about the embarrassing denial that the wholesale slaughter of men, women and children can be defined as genocide? Fundamentalist Christian approaches to education are in no sense 'children-first' movements. They are primarily an ideologically-based education with pedagogical parallels to that used in despotic states such as North Korea. Like the North Koreans they are simply manufacturing children who will act as tools to proselytise their ideology. We should pity children who are subject to such facile indoctrination. How are they ever going to be able to make informed decisions when it comes to matters of public policy involving scientific and complex social issues? Not surprisingly research from the United States clearly shows that biblical fundamentalism and education make very poor bedfellows. Longitudinal studies show that biblical fundamentalism has a substantial negative effect on further educational attainment, especially so for girls. For example, there is compelling evidence that Christian fundamentalist students have smaller vocabularies than their non-fundamentalist Christian counterparts. Christian fundamentalists who do gain access to higher education are far more likely to choose private, overtly religious colleges and universities which offer substantially fewer course options, have no established research programs and are frequently unaccredited by education authorities and so unrecognised by the mainstream university and college community and employers. This choice is essentially due to a high level of paranoia. The starting point for fundamentalist Christians is not one of honest inquiry. Their basic premise is that they alone hold normative, correct beliefs. Those with views contrary to their own, including science, are seen to have an 'agenda' and forever attempting to 'indoctrinate' those with faith. In this regard, fundamentalists are essentially scared of evidence. They perceive that the best way to preserve their beliefs is not to have them challenged, but to hide the evidence from younger believers for as long as possible. Eric Hovind’s education was received entirely from the perspective of young earth creationism and biblical literalism; firstly at home, then at the non-state accredited Pensacola Christian Academy, followed by the unaccredited Jackson Hole Bible College and finally, at Baptist Tennessee Temple University. Eric Hovind's father, the creationist doyen 'Dr' Kent Hovind ("the most colorful creationist at the bottom of the barrel") received his PhD in 'Christian Education' in 1991 from the unaccredited (read 'diploma mill') 'Patriot Bible University' whose 'campus' is not much larger than an affluent suburban home. Actually Patriot Bible University do claim accreditation - from a similarly bogus organisation calling themselves 'Accrediting Commission International', who are not recognised by the education departments of any US state. He has even claimed, via his lawyer, that the the US government does not have the legal right to try him because he does not come under their jurisdiction, citing an obscure legal concept of 'subornation of false muster'. This is really scraping the bottom of a very deep and dirty fundamentalist Christian barrel. In effect, this defence argues that because he is firstly a citizen of God and not the USA, he is not obliged to follow the laws of the state and if he does so he has been effectively sequestered into a group to which he cannot legally belong (i.e., taxpayers) and as such is being induced to do something unlawful! Despite such a novel defence, however, he seems to have had no problem availing himself of taxpayer funded legal counsel. (Note: he has been released since this was written). Not to be outdone in the con-artist game, in March 2013 Eric Hovind posted a video on Facebook asking for 5,000 people to donate $10 a month for the next year so as he can continue the good work his father has now been prevented from doing. This amounts to $600,000 per year. Shortly afterward on his website he increased the requested donation to $20 a month. Eric's brother Chad is another fine chip off the Hovind block. He's behind an outfit called God Quest Inc. that pushes the Christian philosophy of 'Godonomic$' (yes, that dollar sign on the end really is part of the logo) which purports to present God's wish for free market enterprise and his wisdom on work and money (and creationism) in a pack of 6 DVDs for only $377.80. Ironically, they supply these DVDs and other assorted Christian fundamentalist literature to federal prisons under a government grant. Good to know Kent had some suitable material to watch during his incarceration. Thus, people like Eric Hovind and Paul Taylor argue from belief, not reason. Any arguments that address their beliefs are measured not in terms of evidence, or reasonableness, or even honesty, but simply to the degree to which they agree with their beliefs. Thus they have no need or reason to understand any field of study not based on scripture. It is a profoundly dishonest position. Pterodactyls in 17th century Cardiff.......for Christ’s sake!